As it looms over Jack Purcell Park1I really don’t care that the racquet art was inspired by the wrong Jack Purcell., the Governor Metcalfe Apartments at 330 Metcalfe has been witness to a considerable number of changes that have taken place in its front yard, including the construction of the park itself in 1967 and its popular dog run in 2011. The Governor Metcalfe was a project of The Great West Life Assurance Company and Mills Rankin Limited, an outfit based in Montreal. 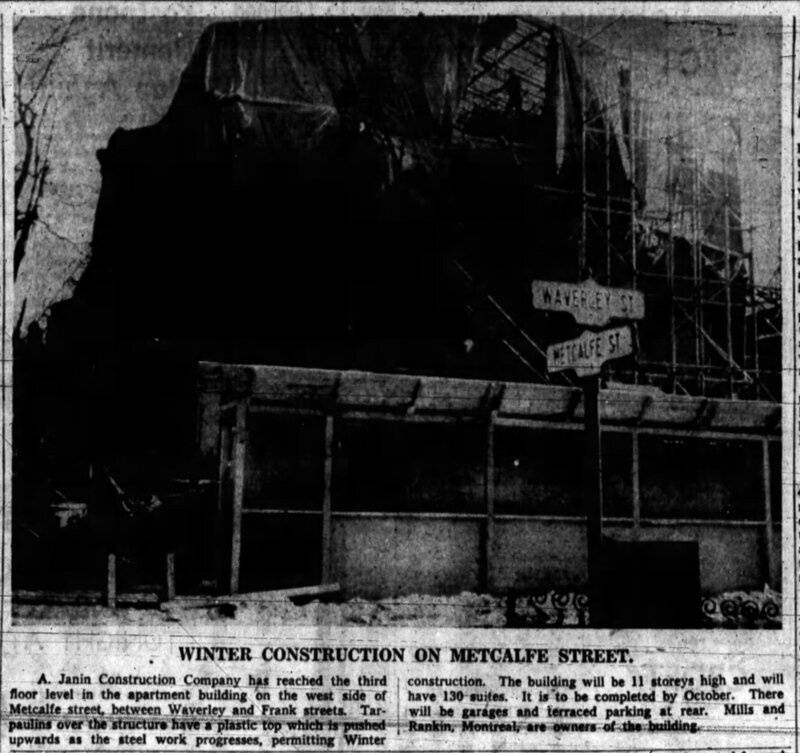 On June 12, 1959, the Ottawa Journal reported that the builder was set to begin construction on a $1,200,000 11-storey building on Metcalfe, between Frank and Waverley streets. 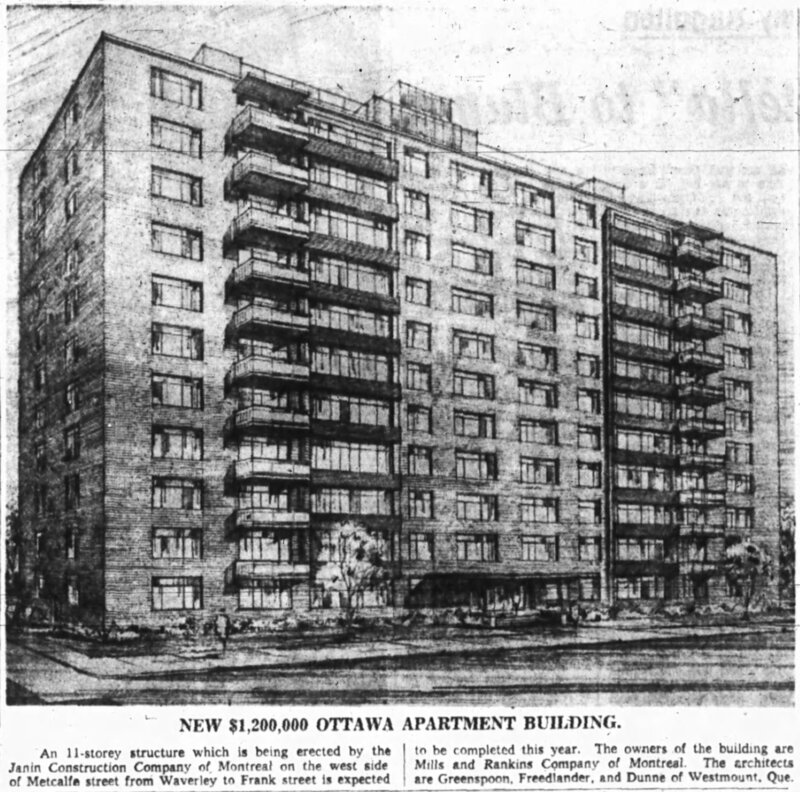 The contractor was A. Janin Construction, also of Montreal.2”Start Metcalfe Street Apartment Building,” Ottawa Journal, January 12, 1959, p. 5. Architects on the project were Greenspoon, Freedlander, and Dunne, also of Montreal.3Ottawa Journal, January 22, 1959, p. 31. Architects for the Governor Metcalfe were Greenspan, Freedlander, and Dunne: a firm familiar with the Ottawa market. Source: Ottawa Journal, January 22, 1959, p. 31. Both Janin and the firm of Greenspoon, Freedlander, and Dunne were quite familiar with the Ottawa market. Janin, for example, won a number of contracts around the capital during the 1930s and 1940s, including Werner Noffke’s post office at Elgin and Sparks4”Too Many Sidewalk Bosses Here,” Ottawa Journal, August 14, 1939, p. 1. and Temporary Building No. 2, on Wellington.5”Janin Company is Awarded Contract,” Ottawa Journal, April 26, 1940, p. 16; “War Buildings In Ottawa Cost $1,035,660,” Ottawa Journal, November 21, 1940, p. 24. The firm of Greenspoon, Freedlander, and Dunne had designed a number of projects in Ottawa, including the Alta-Vista Shopping Centre,6”Shopping Centre On Alta Vista Soon Under Way,” Ottawa Journal, September 20, 1955, p. 16. Reuben Palef’s apartments on Alta-Vista,7”Building $400,000 Apartment Block on Alta-Vista Drive,” Ottawa Journal, November 25, 1955, p. 9. the Doctors’ Building at O’Connor and MacLaren, the Parkway Motel on Rideau,8”Rideau Street 60-Unit Motel Ready in June,” Ottawa Journal, January 5, 1956, pp. 1, 2. and Ottawa Fruit Supply’s warehouse on Industrial.9Ottawa Journal, November 9, 1957, pp. 36-37. Construction of the Governor Metcalfe continued through the winter. Source: March 11, 1959, p. 39. Janin got to work immediately, constructing the Governor Metcalfe through the winter months.10Ottawa Journal, March 11, 1959, p. 39. This wasn’t unknown of course, but it was worthy of the Journal’s attention. While the crews were working on seeing that the building would be ready for occupancy that October, Great West Life had also purchased the the Sandringham Apartments in Sandy Hill.11Ottawa Land Registry Office, Plan 15632, Blocks 53, 60, Reel 4AR123; “Sandringham Apartments Sold For $2 Million,” Ottawa Journal, April 14, 1959, p. 1; “Closing Deal to Purchase Sandringham,” Ottawa Citizen, April 15, 1959, p. 9. Mills Rankin Limited began renting out The Sandringham once the deal was complete. Source: Ottawa Journal, June 10, 1959, p. 48. The Governor Metcalfe was completed in time for its desired October occupancy and tenants began to move in. The Governor Metcalfe was ready for occupancy in October 1959. Source: Ottawa Journal, September 11, 1959, p. 15. Although Mills Rankin advertised both buildings together, it may have been the case that they had more difficulty with the Sandringham, as there appears to have been a larger effort to advertise it in the pages of both the Citizen and the Journal. Ottawa Journal, January 22, 1960, p. 8. Ottawa Journal, January 12, 1960, p. 37. It may have also simply been the case that Great West Life and/or Mills Rankin felt that the Sandringham was the more valuable investment, at nearly twice the price of its own Governor Metcalfe. This was also reflected in the monthly rents. Neither building was inexpensive, though the Sandringham was clearly a cut above in rents commanded. Source: Ottawa Journal, April 13, 1960, p. 45. By the fall of 1960, the Toronto General Trusts Corporation was appointed as the rental agents for the Mills Rankin buildings in Ottawa (Sandringham and Governor Metcalfe, leaving Mills Rankin to building management).12Ottawa Journal, October 14, 1960, p. 18. This arrangement remained in place until 1962, when Great West Life took over the operation of the buildings directly.13Ottawa Journal, May 18, 1963, p. 23. Owned and managed by The Great West Life Assurance Company. Source: Ottawa Journal, May 18, 1963, p. 23. 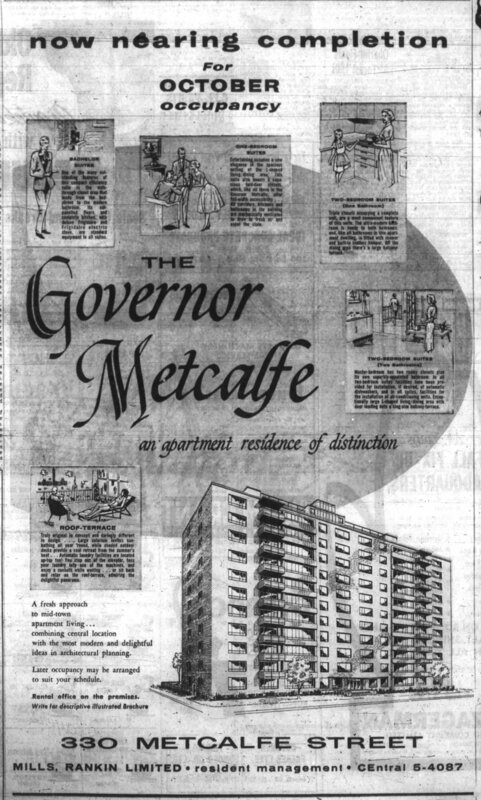 The Governor Metcalfe was sold by Great West Life to “a group of Ottawa men” during the summer of 1964.14”Purchase Metcalfe Apartments,” Ottawa Journal, July 2, 1964, p. 5. The “group of Ottawa men” included Reuben Palef, Samuel Palef, Roger Seguin, Richard Coates, and George Nelms.15Ottawa Land Registry Office, Plan 15558, Lots 14, 15, 16 Metcalfe W, Pt. Lot 14 Waverley S, Reel 4AR122. The same group purchased the Sandringham the following spring.16Ottawa Land Registry Office, Plan 15632, Blocks 53, 60, Reel 4AR123. 1. ↥ I really don’t care that the racquet art was inspired by the wrong Jack Purcell. 2. ↥ ”Start Metcalfe Street Apartment Building,” Ottawa Journal, January 12, 1959, p. 5. 3. ↥ Ottawa Journal, January 22, 1959, p. 31. 4. ↥ ”Too Many Sidewalk Bosses Here,” Ottawa Journal, August 14, 1939, p. 1. 5. ↥ ”Janin Company is Awarded Contract,” Ottawa Journal, April 26, 1940, p. 16; “War Buildings In Ottawa Cost $1,035,660,” Ottawa Journal, November 21, 1940, p. 24. 6. ↥ ”Shopping Centre On Alta Vista Soon Under Way,” Ottawa Journal, September 20, 1955, p. 16. 7. ↥ ”Building $400,000 Apartment Block on Alta-Vista Drive,” Ottawa Journal, November 25, 1955, p. 9. 8. ↥ ”Rideau Street 60-Unit Motel Ready in June,” Ottawa Journal, January 5, 1956, pp. 1, 2. 9. ↥ Ottawa Journal, November 9, 1957, pp. 36-37. 10. ↥ Ottawa Journal, March 11, 1959, p. 39. 11. ↥ Ottawa Land Registry Office, Plan 15632, Blocks 53, 60, Reel 4AR123; “Sandringham Apartments Sold For $2 Million,” Ottawa Journal, April 14, 1959, p. 1; “Closing Deal to Purchase Sandringham,” Ottawa Citizen, April 15, 1959, p. 9. 12. ↥ Ottawa Journal, October 14, 1960, p. 18. 13. ↥ Ottawa Journal, May 18, 1963, p. 23. 14. 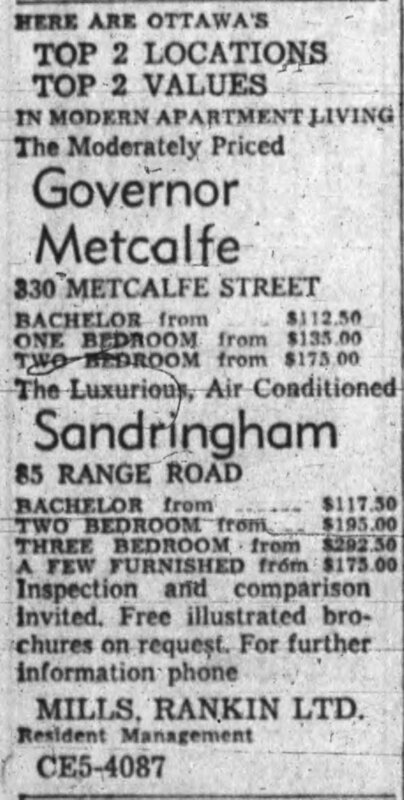 ↥ ”Purchase Metcalfe Apartments,” Ottawa Journal, July 2, 1964, p. 5. 15. ↥ Ottawa Land Registry Office, Plan 15558, Lots 14, 15, 16 Metcalfe W, Pt. Lot 14 Waverley S, Reel 4AR122. 16. ↥ Ottawa Land Registry Office, Plan 15632, Blocks 53, 60, Reel 4AR123. Thank you for the info on the Governor Metcalfe. I lived at the Governor Metcalfe from 1992 to 1997 in a lovely two-bedroom apartment on the south-west corner of the 10th floor with an obstructed view to the south and west. Although the apartment was somewhat dated, it was airy, bright, and quiet. The building was well managed. I miss it still! I should have added that I’d heard that the builders had approval for 12 storeys, but decided to build 11 storeys with ceilings higher than the usual 8 ft. The higher ceilings attributed to the airiness of the apartments. Thank-you for sharing! I’ve always found it to be an interesting building. I think that it made sense for them to go a little “higher brow” with the Governor Metcalfe (12 -> 11 floors), particularly as their purchase of the Sandringham went through. They really did try to position themselves as a cut above.